Umbrellas don’t have to be ordinary… they can be extraordinary! 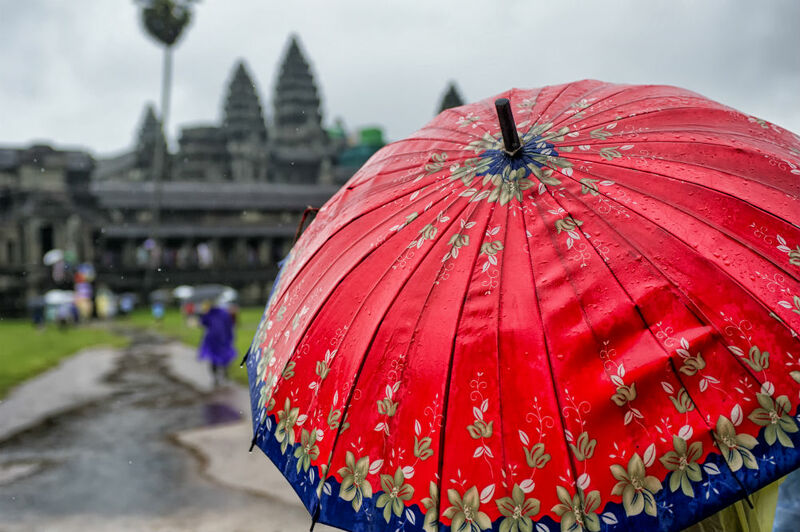 You might be surprised that there are a lot of cool umbrellas out there. So, how cool of an umbrella are we talking about? We are not only talking about umbrellas that have cool designs, we also have a selection of umbrellas that have awesome features. Is your curiosity piqued? Well, it should be! At The London Umbrella Seller, our years of experience mean we know what makes a quality umbrella. 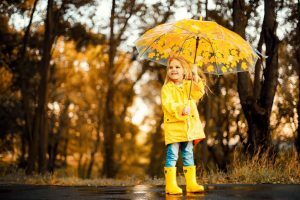 We researched hundreds of umbrellas and have picked out five umbrellas that have that “cool” aspect to them. 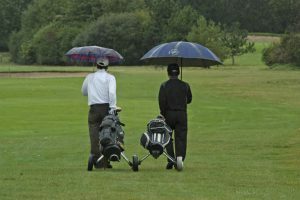 By the end of this read, you should be able to find the perfect umbrella for you! We’ve done all the research so you don’t have to! 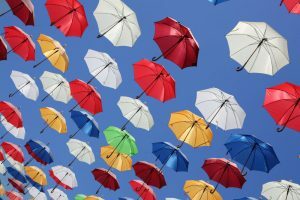 The five umbrellas we evaluate here will surely catch your attention when deciding which umbrella is perfect for you. Since they are all so cool, we are going to outline their features, pros, and cons. By doing so, we can help further narrow down your choices. Yes, you read that right! A lightsaber umbrella. With this type of umbrella starting off this review, the bar is set high for the other umbrellas. This one is sometimes referred to as the Star Wars Umbrella due to the weapon in those films. The lightsaber concept of this umbrella is actually the shaft that is holding the product together. What is more amazing is that it has seven LED light options such as blue, green, red, and purple that works when the product is loaded with AAA batteries. More than that, it has a flashlight at the bottom, which can be turned on and off by the button on its handle. So handy to light your path. That said, you don’t have to light up the umbrella every time you use it since it can just be a regular umbrella. Just like other umbrellas, it does its primary job of protecting you from snow, rain, sun, and hail. It has a length of 32 inches while its diameter when opened is 40 inches. Let’s now move on to one of the most stylish cool umbrellas we have found. 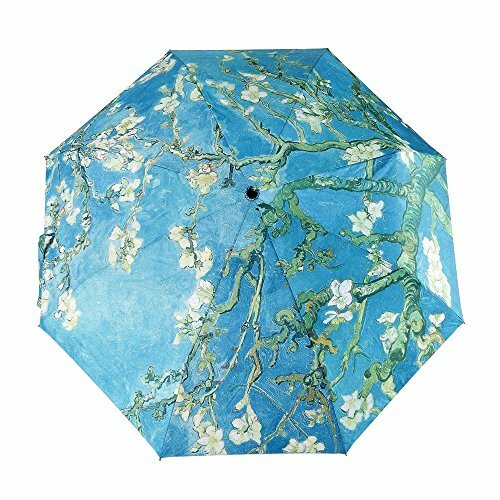 It has an elegant design from the famous oil painting of Vincent Van Gogh, and this design is the main selling point of the umbrella. This umbrella is such a talking point. This umbrella has a canopy that is made of two layers of materials and two different types of coating. This kind of construction makes it windproof and rainproof, as well as provides UV protection. 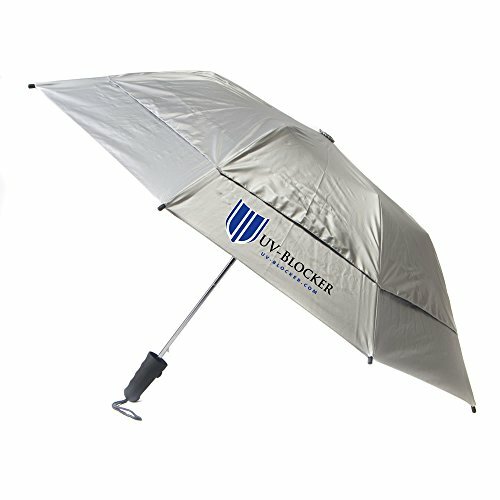 With regard to the umbrella type, it’s a small compact umbrella that can fit in your bag easily. Likewise, you do not have to open it manually, as you can just click a button for it to deploy. 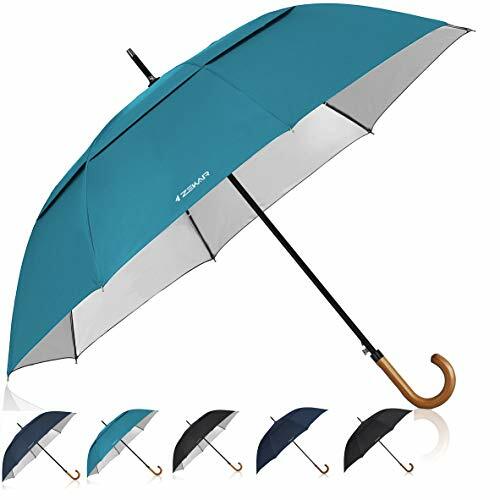 When you click it again, it snaps closed automatically, you then simply collapse the shaft manually like with other automatic umbrellas for proper storage. As for its ribs, they are made of sturdy steel and high-density fiber so that it can resist strong rains and winds. 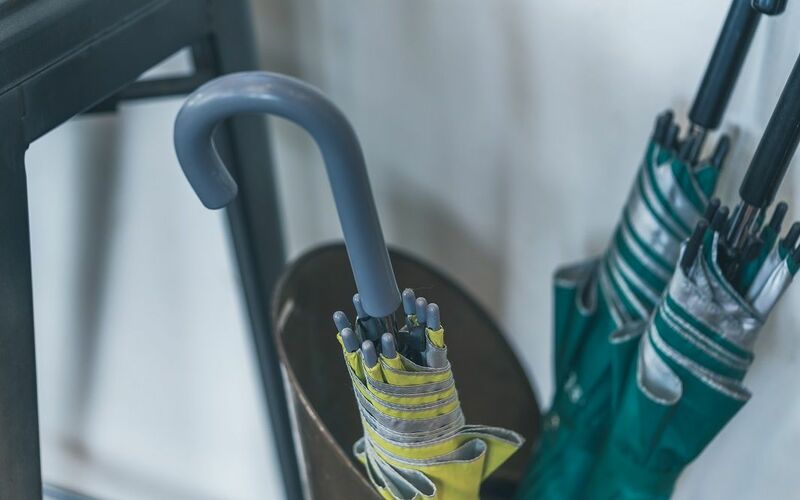 Lastly, its handle is made of frosted rubber that can be held easily and comfortably, very important when its raining heavily and blowing a gale! Moving on to our next umbrella, this one is cool due to its functionality. 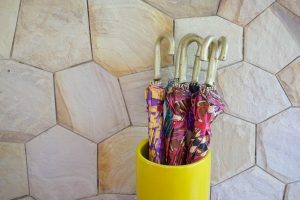 This umbrella is a stick-style umbrella (as opposed to a compact folding umbrella) and is one of the biggest umbrellas available with a J-type handle. This product has a double “vented” canopy design that is made of windproof materials that allow proper airflow through the vents. It’s really clever as the overlap of the materials stops rain coming through, however allows wind through to prevent pressure build up that can snap a frame. 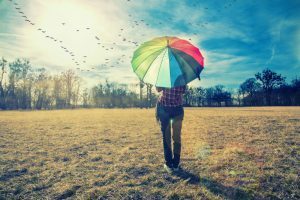 It can actually prolong the life of the umbrella. It comes in two varieties namely the classic edition and UV-protection series. That said, each variety comes in different colors namely black, navy blue, and sky blue, as well as navy UV and sky blue UV. 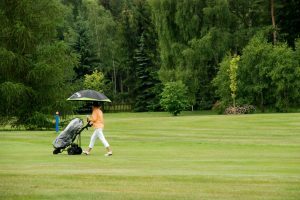 Similarly, the umbrella comes in two different sizes, which are a very large 54 inches and a huge 60 inches that are designed for one person and two to three people, respectively. It has a J-shaped handle that is constructed from bamboo and looks superb. Judging from the name of the brand itself, you really have to expect that what you get is an umbrella that can protect you against the sun’s harmful UV rays. That is precisely what this umbrella is all about. In fact, it is even called Sun Blocking Umbrella. 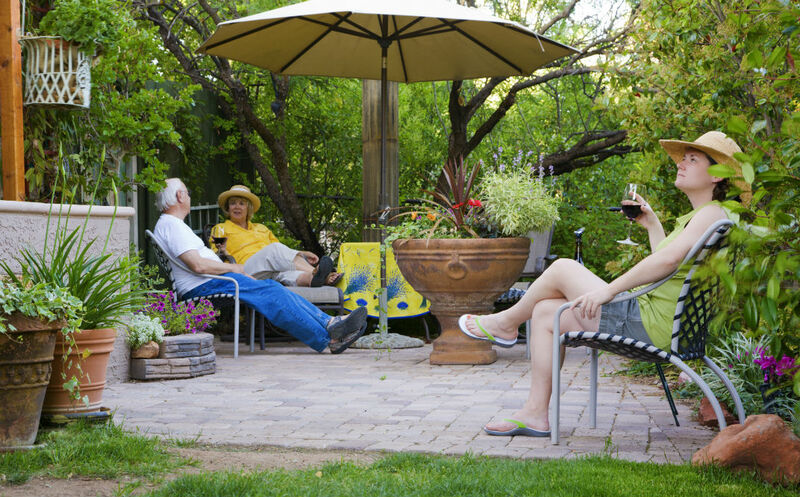 Being recognized by the Melanoma International Foundation, this umbrella is constructed with materials that offer up to UPF 55+ of protection. At the same time, it can block up to 99% of UVA and UVB rays. 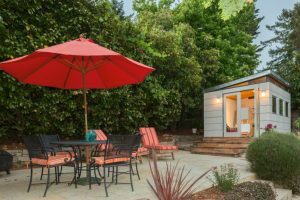 What is more interesting is that it has a double canopy vented mesh system that can help lower the temperature underneath by up to 15 degrees when it is in use. More than that, it has a ventilation design that helps with proper airflow. 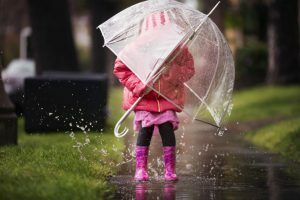 Additionally, it is water repellent to help you stay dry on rainy days. Last on our list is a prettier and portable version of the previous umbrella we reviewed. It’s not as serious in deflecting heat and processing airflow, however when it comes to looks, this umbrella is very pretty indeed. Further, its size is perfect to be carried anywhere. This product is made of polyester and can offer UPF 50+ of sun protection due to its inner coating of vinyl; this will also keep the heat out. Additionally, it is waterproof and windproof. With regard to the ribs within the frame, they are made of stainless steel and fiberglass. 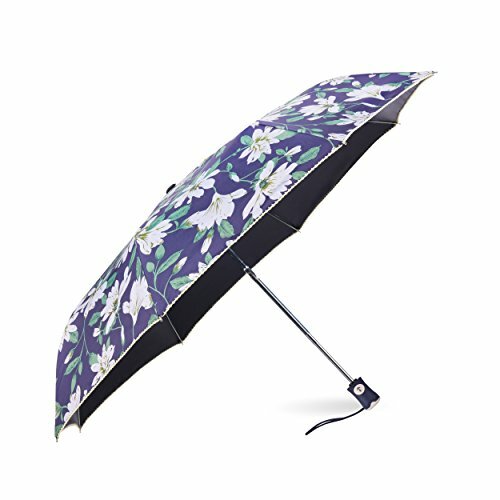 When it’s folded, its size is about 11 inches so very portable indeed, and when opened, it is nearly 39 inches in diameter, a generous canopy diameter for a compact folding umbrella. It has a rubber handle wherein an easy-press button is integrated to open and close the umbrella automatically. Which Is the Coolest One? All the umbrellas above are cool and unique in their own ways. 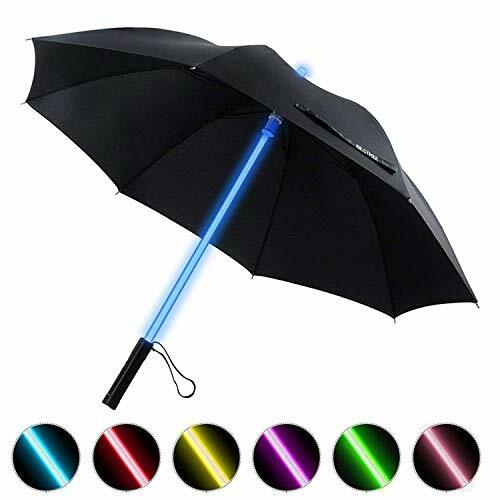 If we had to choose one that stands out, it would be BESTKEE Lightsaber Umbrella, its the kind of umbrella that turns heads and is definitely a talking point. Waving the umbrella through the air is very likely to met with a shout of “cool” from someone nearby! A close second would be the UV-Blocker Umbrellas Travel Umbrella. It might not look as cool as the other ones, but when it comes to protecting the user against the sun or rain, it performs very well indeed.